The badminton team had strong victories over Andrew Hill and Leland last week. On Monday, the Monarchs beat Andrew Hill, 10-5. The Monarchs swept singles, men's doubles, and mixed doubles in the match. On Wednesday, the Monarchs beat Leland, 8-7. The Monarchs swept men's and mixed doubles. A special congratulations to junior Leo Cheng, who is currently 10-1 this season and competed in men’s singles and won his match 21-9, 27-25. Several of the Monarch teams have impressive 10-1 records, including the men's double duo consisting of freshman Kevin Ngo and junior Justin Lam. The mixed doubles pair including seniors Kajal Patel and Jeffrey Qu also has a 10-1 record. Congratulations, Monarchs! The men's golf team beat Sacred Heart Cathedral and Archbishop Riordan last week, adding three victories that boosted the team's league record to an impressive 9-2-1. On Monday, the team played in a super match and beat Sacred Heart Cathedral and Archbishop Riordan with a team score of 189, while the league rivals came in with team scores of 204 and 244, respectively. Senior Brian Ma was the overall medalist, scoring -2 under 34. On Thursday, the Monarchs had another match against Archbishop Riordan where they emerged victorious with a team score of 183 to Archbishop Riordan's team score of 218. The Monarchs had two medalists: senior Brian Ma, who shot 2 over 36, and freshman Nathan Wang, who shot 1 under 33 and is the current overall WCAL scoring leader. Great job, Monarchs! The track and field team had excellent performances last week, defeating St. Ignatius and setting a school record at the Arcadia Invitational. On Wednesday, the Monarchs defeated the St. Ignatius Wildcats, 69-67. Senior Camille Morales finished in first place during her first 100-meter hurdle race of the season. Freshman Sarah Nakhoda also had an excellent performance, taking first place in the open 400-meter race with a personal record time of 61.85 seconds. The women's track team is currently 4-1 heading into the league finals. On Friday, the men's 4x800-meter relay team added to the program's week of strong performances by breaking a school record. The Monarchs set a new record by finishing the race with an impressive time of 8 minutes and 15 seconds. Congratulations to sophomores Taylor Iden, Connor Chancey, and Matthew Cervantes, and senior Devon Dupree for being part of the record-breaking team. Great job, Monarchs! The men's and women's lacrosse teams beat Mountain View in a double header this weekend. On Saturday, the women's team defeated the Spartans, 16-3, with seniors Malina Hatton and Ania McNicholas each contributing three goals and an assist. Senior Gabby Valdez and sophomore Olive Carlino each added two goals. That same afternoon, the men's lacrosse team won their game against the Spartans, 9-3. Senior Lucky Singh converted 13/15 faceoffs and junior Larkin Koker added nine saves. Congratulations, Monarchs! The men's volleyball team defeated Sacred Heart Cathedral in four sets, 25-22, 25-23, 22-25, and 25-17, to bring home a victory on Senior Night. Junior Dylan Zhai had 13 kills while senior Lucas Sant’Anna contributed 11 digs and seven aces. Great job, Monarchs! The men's tennis team started the season strong by taking the California Classic Championship on Friday. The team traveled to Fresno, where they took the top title. Sophomores Brian Chong and Brian Liu each played singles and did not drop a set. Great job, Monarchs! Monarchs from the men's and the women's basketball teams and the women's soccer team were named players of the year in February. Junior Devan Sapp was named the league's WCAL Player of the Year from the men's basketball team. Last week, he was also named the CCS Player of the Year by Cal-Hi Sports. For women's basketball, senior Haley Jones was named the WCAL Player of the Year and the CCS Player of the Year. 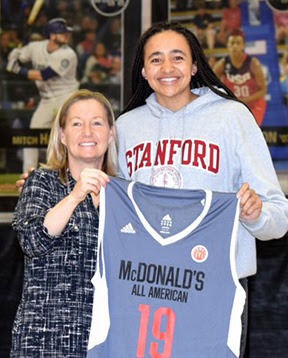 At the all-school assembly last Friday, the school also presented Haley with a McDonald's All American jersey, honoring her for being selected from a nationwide pool of more than 700 nominees to participate in the McDonald's All American Game, which will be held in Georgia in March. A third Monarch received the highest possible league honor in women's soccer. Congratulations to senior Camille Lafaix, who was named WCAL Co-Player of the Year today. Congratulations to all the winter sports teams on their achievements this year! Tryouts for the swimming and diving team ended in mid-February, and the team is already hard at work competing and serving the local community. The women's swimming and diving team won its first match against Presentation, 116-70. 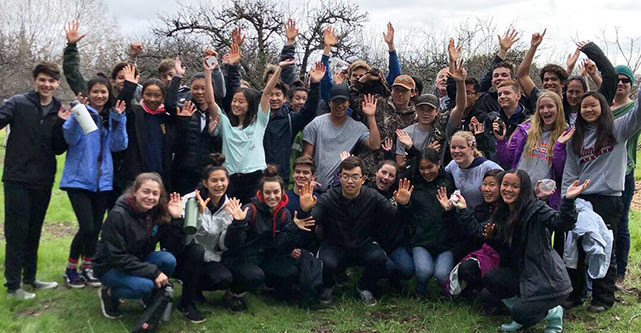 Despite the rain, the swimming and diving team gathered at multiple locations this past weekend to serve the community, lending a helping hand at Guadalupe River Park Conservancy's Heritage Rose Garden and Historic Orchard. 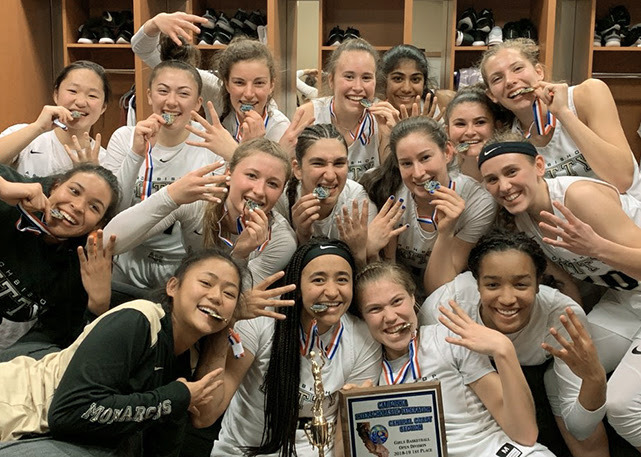 The Monarchs took home CCS Open Division Championships in women's soccer and basketball during back-to-back games held at Santa Clara University on Friday. In what proved to be a particularly excellent weekend, the men's soccer team also won the CCS Division II Championship the following day. 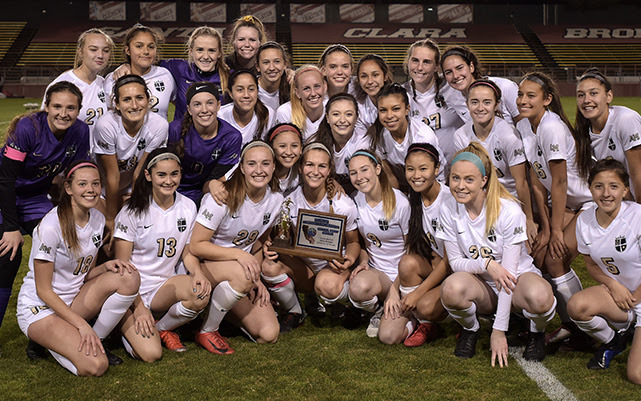 The women's soccer team beat reigning WCAL Champion St. Ignatius, 1-0, taking home the CCS Open Division Championship and the program's 16th sectional title. Sophomore Kylie McHale scored the game-winning goal and was named the Player of the Game on MaxPreps by her coach. The pivotal goal came in the first half, with an assist from junior Svea Neunfinger. Read more about the game in The Mercury News. The women's basketball team faced state powerhouse Pinewood, the reigning NorCal Champions for 2018, in a showdown in Santa Clara University's Leavey Center, where the Monarchs toppled the Panthers, 72-51. The Monarchs took home the program’s fourth consecutive CCS Open Division Championship, a special achievement for the team's five seniors, who will graduate in just a few months. Stanford-bound senior Haley Jones added 26 points and nine rebounds. Sophomore Hunter Hernandez contributed 21 points and a game high of 10 rebounds. Hunter was named the Player of the Game by her coach on MaxPreps for her efforts. The team is currently ranked No. 1 in the nation by MaxPreps. The Monarchs received a bye in the first round of NorCal playoffs and will compete in the semifinals at 6:00 p.m. on Saturday, March 2nd, in the Fien Gymnasium. The men's soccer team beat Menlo School, 1-0, to claim the CCS Division II Championship, the program's first CCS title in three years. Sophomore Santi Andrade scored the game's deciding goal with an assist from senior Oscar Toulet in the second half. The key shot was Andrade's second goal of the season, with his previous goal coming in during the CCS quarterfinals. The CCS championship is the program's sixth title. Read more about the game here. The men's soccer team will open the NorCal Division III Tournament at 3:00 p.m. on Wednesday, February 27th, at University High School. On Friday, juniors Davis Salom and Andrew Forman won their quarterfinal matches. These Monarchs capped off their seasons by placing fourth in their respective weight classes at the CCS Championships. Congratulations, Monarchs! 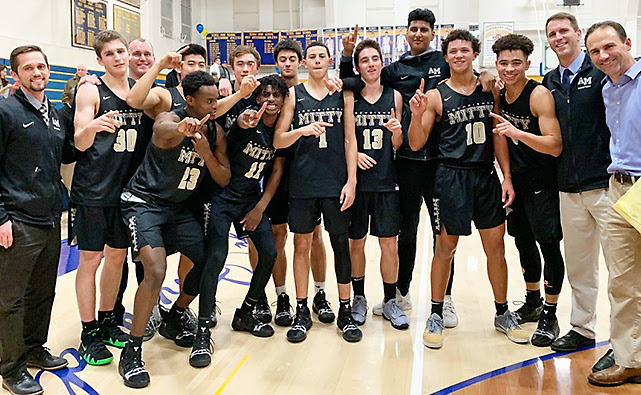 Earlier this month, the men's basketball team won the WCAL Championship with an 11-3 league record. On Friday, they lost to Sacred Heart Cathedral, 69-65, in the CCS Open Division Quarterfinals. The Monarchs will play the Serra Padres at home this week in the CCS Open Division Consolation Game. Cheer on the team starting at 7:00 p.m. on Thursday, February 21st, in the Fien Gym. On Friday, the Monarchs were victorious in the CCS Open Division Quarterfinals, beating Eastside College Prep, 83-48. The Monarchs took the lead in the first quarter, 24-9, and kept ahead of the Eastside College Prep Panthers for each quarter that followed. Stanford-bound senior Haley Jones led the way with 27 points, 14 rebounds, five assists, and three steals. Cornell-bound senior Ania McNicholas added 18 points and four steals. Great job, Monarchs! 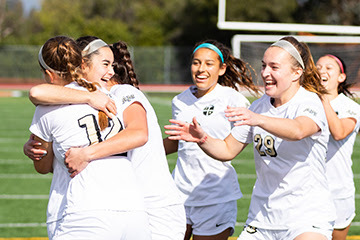 On Saturday, the women's soccer team won the CCS Open Division Quarterfinals, securing their spot in the semifinals. The Monarchs beat Los Gatos High School, 1-0, with a match-winning goal from senior Shannon Coyle in the fourth minute of the game. Shannon was named the Player of the Game by her coach on MaxPreps for her perfectly bent corner kick. Congratulations, Monarchs! On Saturday, the men's soccer team defeated Greenfield, 3-2, in the CCS Division II Quarterfinals. Senior Mica Sinko scored the Monarchs' first goal with an assist from senior Owen Byrnes. 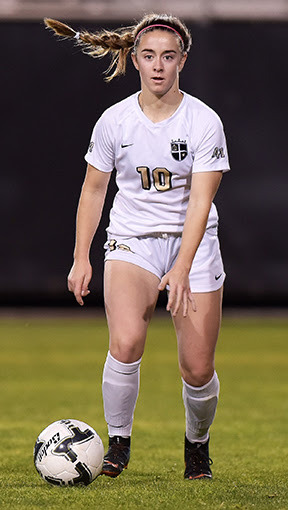 The score was tied before halftime, but the Monarchs quickly put the score back in their favor in the second half with two goals in the first seven minutes of play. Sophomore Santi Andrade made the first goal of the second half with a shot from 30 yards away, while junior captain Tyler Stevenson scored the winning goal of the match, which was his first goal of the season. Great job Monarchs, and good luck in the semifinals tomorrow! 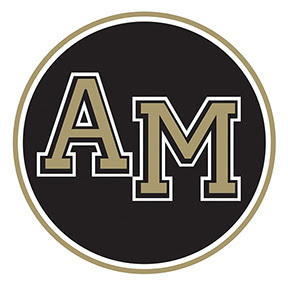 Follow the Athletics Department on Twitter to get scores for the games you can't attend. Go Monarchs! Junior Mason Ryan's 3-pointer in the last minute of play against the Serra Padres clinched not only the game but the WCAL Championship last Friday. The men's basketball team punched out a 56-55 victory, seizing the WCAL Championship. In the third quarter, the Monarchs, who had previously trailed the Padres, tied the score, 51-51, thanks to clutch 3-pointers from juniors Marcus Greene and Mason Ryan. Free throws from Serra put the Padres back in the lead but an answering basket from junior Devan Sapp tied the score a second time, 53-53. The Padres added a two-point layup but the Monarchs responded with Ryan's 3-pointer, which sealed the game. Sapp lead the way in scoring with a game high of 22 points, while Greene added 13 points, and Ryan had 12 points and nine rebounds. Read more about the team, which Mercury News reporter Darren Sabedra says has "broken plenty of hearts this season" as they moved toward their championship victory last week. Watch Monarchs vs. Bellarmine at 7:30 p.m. tonight. Can't make it to the away game? Watch live streaming video from NorCal SportsTV here. Go Monarchs! The wrestling program had four Monarchs qualify for the CCS Championships this weekend. 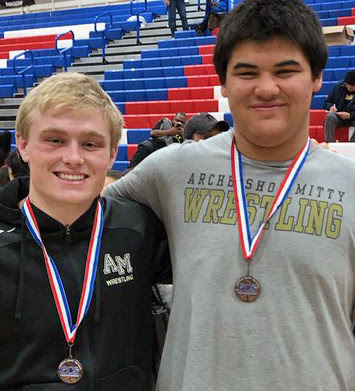 Juniors Andrew Forman and Davis Salom each finished in second place in their weight classes at the WCAL Championships on Saturday and earned spots in the CCS Championships this week. Senior Ryan Smith and junior Connor Edelman finished in third place in their respective weight classes and will also advance to the CCS Championships. Great job, Monarchs! 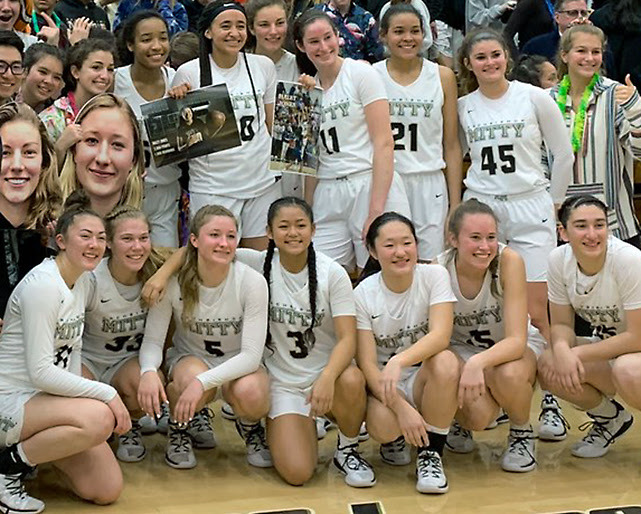 The women's basketball team finished their league season with a WCAL Championship and a flawless 10-0 record. On Friday, the Monarchs beat St. Francis by a score of 80-26 during Senior Night to claim the top title. Senior Charlize Andaya had nine points, sophomore Hunter Hernandez contributed 15 points, and senior Haley Jones recorded a triple double with 31 points, 17 rebounds, and 10 assists. Jones also scored her 2000th career point and 1000th rebound. For the past four years, the senior class that was celebrated on Friday has gone undefeated in WCAL play with a perfect 42-0 record. Congratulations, Monarchs! The Monarchs had victories against league rivals Valley Christian and St. Francis this week and are first in the WCAL with a 9-2 record. On Saturday, the Monarchs beat Valley Christian, 88-42. Six players scored in the double figures with junior Devan Sapp contributing 16 points, five rebounds, and four assists, junior Owen Browne adding 16 points, and freshman Aidan Burke adding 13 points and four rebounds. Earlier in the week, the team beat St. Francis, 75-45. Devan had 20 points and three rebounds, while junior Marcus Greene added 19 points and six rebounds, and sophomore Michael Mitchell had 11 points and six assists. The Monarchs continue to hold the No. 1 spot in the WCAL with a perfect, 8-0, league record. This week, the team added victories over St. Ignatius and Presentation to the books. On Friday, the Monarchs beat St. Ignatius, 94-50. The Player of the Game award went to the entire team for "excellent shooting, aggressive play, and — above all — team togetherness," according to MaxPreps. Senior Haley Jones had 27 points, 11 rebounds, seven assists, and five blocks, while junior Ashley Hiraki had 14 points, and sophomore Marley Langi and senior Ania McNicholas each added 11 points. On Tuesday, the Monarchs beat Presentation, 83-32. Jones led the way with 25 points and 13 rebounds, while Langi had 13 points and 10 rebounds, and sophomore Hunter Hernandez contributed another 14 points and 8 rebounds.